A fast sample made in 2013 by Americo Gobbo with Dry Media paint dynamics and parametric brushes. 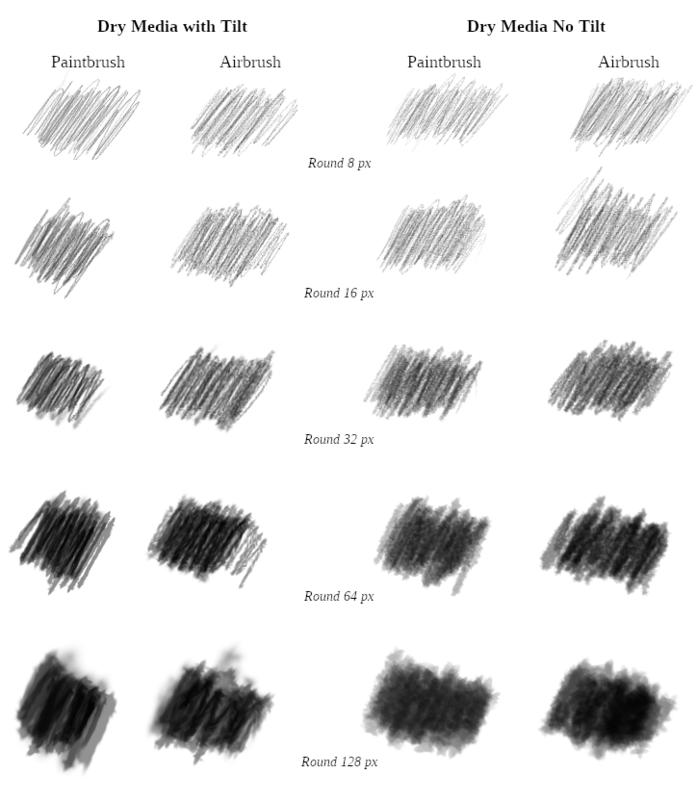 The parametric brush is a vector brush and it has the great possibilities and flexibility for many different tasks and branches (graphic design, photography, digital painting, etc…) The raster brush is also versatile and has great pictorial qualities, but is more complex to build because it is managed as an image. Probably the choice, between raster and/or parametric brush, is done by the kind of task, the painter’s style and of his/her artistic background/knowledge/taste, etc. It seems artists haven’t yet realized the full usefulness and versatility of GIMP’s parametric brushes, especially when paired with the proper dynamics. 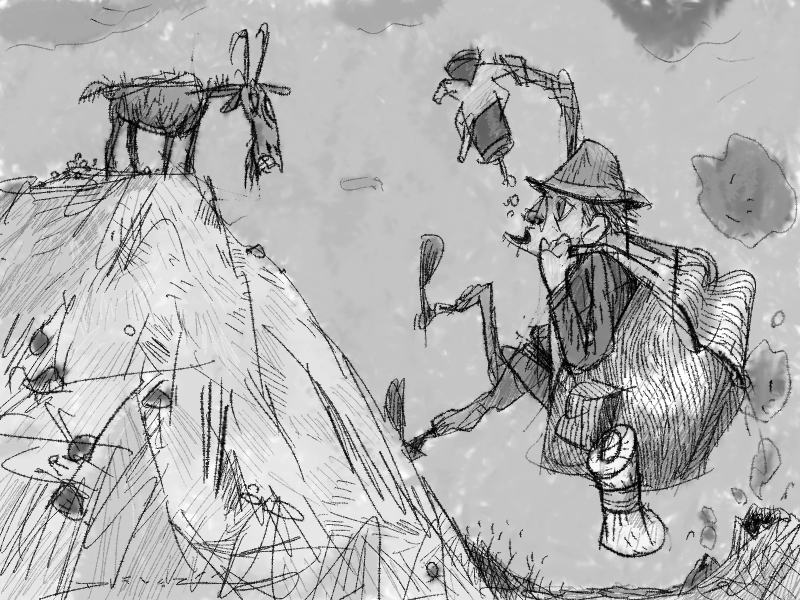 This article shows how to use parametric brushes to make convincing emulations of dry media such as pencil, color pencil, charcoal, chalk and pastel. Brush set and Parametric Editor (.vbr). The default shapes are round, square and diamond. It’s also possible create a great variation of the shapes using the different parameters to control the shape and its aspect (radius, spikes, hardness, aspect ratio, angle and spacing). 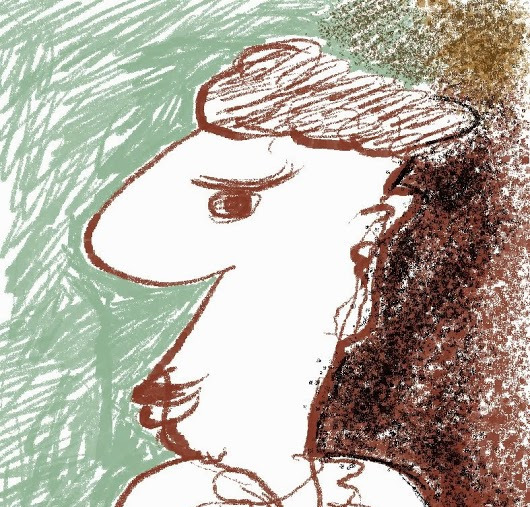 In 2013, I began to study emulating dry media with parametric brushes, they are essentially the drawing tools such as pencil, crayon, charcoal and pastel. I have also invited Gustavo Deveze and Elle Stone to use my parametric brush set with 2 paint dynamics dedicated exclusively to dry media. Gustavo Deveze drawing with the Dry Media paint dynamics with the brush set of parametric brushes. To explore the dry media effects with parametric brushes, I have revised initially in 2013, the Pencil Generic Paint Dynamics to adapt better it to other dry media. After working with the variations of Pencil Generic, I have found a good compromise, but the methodology was complex and based only on trial and error. I have thought it interesting to understand better real media and to try a way of modeling the effects via paint dynamic making a good attempt of real variables on these media. The first steps have demonstrated good results, and I will describe this methodology in another article. I have also verified that it’s possible to use different tools, pencil, paintbrush and airbrush. Effectively the airbrush is most interesting mainly due to the Rate and Flow controls. Samples using round parametric brushes of the set with my paint dynamic Dry Media. In general, all brush sizes are working well, but mainly between 8 ~ 64 pixels seems the best compromise. The large brushes are interesting for covering large areas but it’s not possible to have a good shape (they are appearing a bit soft). Samples using round parametric brushes with different shapes with Airbrush tool. Tool. 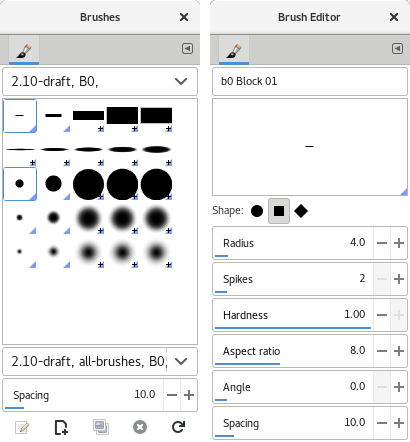 The brush set, in the ‘B0’ folder, contains the .vbr basic brushes, round and block (hard and soft versions). There are two paint dynamics: one for graphics tablet’s stylus with tilt and not. The version with tilt is fun to use and it’s possible to emulate well the effect when you are inclining the tool in real cases. In general, it seems that users prefer to pick the brushes directly on the dialog palette. The parametric brush is so easy to modify and create our own set… but many people don’t have time and ‘energy’ to build own our brushes. To those, that they think that is a large set they could delete the brushes not usable for them. 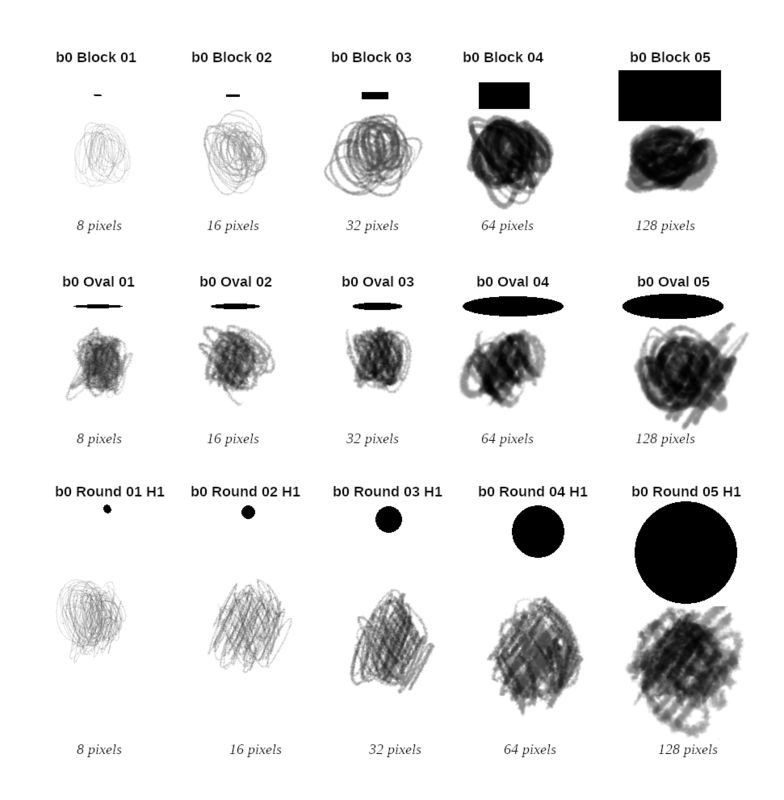 Download Brush Set + Paint Dynamics. Enable the Jitter and use values between 0.5 ~ 0.75 circa. Force¹ at 100% (normally is 50% by default). Motion Only, read this excerpt of The Book of GIMP: A Complete Guide to Nearly Everything. By Olivier Lecarme, Karine Delvare. ¹ Only in GIMP 2.10 and 2.99 Devel. Airbrush, my proposal of the settings for the dry media effects. We have tested on GIMP 2.10, 2.99 and 2.8 with good results. To Elle Stone and Gustavo Deveze who helped me with paint dynamics tests and images to illustrate this document. Also, thanks to Pat David for giving me support with GitLab and formatting of the article for www.gimp.org. GIMP Tutorial - Parametric Brushes (text, images, brushes) by Americo Gobbo is licensed under a CC0 1.0 Universal Public Domain Dedication.